When President Garfield was shot by a madman in 1881, the doctors called Alexander Graham Bell. They asked him if he could use his scientific knowledge to hurriedly build a metal detector so they could find the bullet lodged in Garfield’s body, so they would not have to do major exploratory surgery. Bell immediately set to work, and succeeded in making the device. Unfortunately, when he tried it on Garfield, it didn’t work. It may have failed because there was a mattress made of metal underneath the cloth one, that may have created too much interference for the machine. Sadly, many of Bell’s scientific contemporaries heard of his failure and laughed at him. I learned of this event by reading the endnotes of the time travel story, Master of Sound. Today I return to my “times two” blog roots, and feature reviews about two time travel books with a similar focus, in this case, Alexander Graham Bell. I was updating my time travel series list, when I realized I had mostly overlooked the two extensive series, The Treasure Chest and Blast to the Past, from which these books are taken. 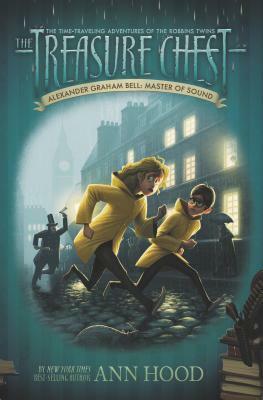 Alexander Graham Bell #7: Master of Sound (The Treasure Chest), by Ann Hood (2013, 159 pages). In Book 7 of The Treasure Chest, Maisie and Felix meet a young Alexander Graham Bell (the inventor of the telephone) in Edinborough, Scotland, just as he leaves for a year with his grandfather, an elocutionist, in London. When the twins get separated from Alexander, they join the thousands of orphans in the streets of Victorian London. Maisie becomes an orange seller and Felix a chimney sweep as they search the foggy streets for Alexander…and each other. Back at home, they cope with the upcoming wedding of Great Uncle Thorne, who makes them leave Elm Medona and return to the upstairs servants quarters. I’m glad I overcame my initial aversion to the bug-eyed children pictured on the cover to read this fine book. This story was packed with history, especially regarding the role of children in Victorian England. It was more about the Victorian era generally than Alexander Graham Bell in particular. We do learn that Bell’s father was world-famous for the system he had worked out for teaching deaf children, and that Alexander followed in his footsteps. It’s a pretty simple plot and things work out a little too conveniently, but I believe that’s fine in a book for this age group. The boy was the more timid sibling, which was refreshing. Bell’s Breakthrough, Blast to the Past by Stacia Deutsch and Rhody Cohon (2005, 99 pages). What if there were no telephones? That won’t happen if Abigail and her classmates blast into the past and persuade Alexander Graham Bell not to give up on his invention! Abigail is getting restless. It’s been three weeks and she hasn’t time traveled once! Luckily it’s Monday again, so when Mr. Caruthers asks the class, “What if Alexander Graham Bell quit and never invented the telephone?” Abigail knows it’s time to go back to the past—this time, to 1876! But when the kids find Professor Bell, he has given up on the telephone. In fact, he is hard at work on a new invention! Abigail and her friends have to get him back on track, but can they make a connection with the most stubborn inventor they’ve ever met? This was also a quick (after all, the kids only go back in time for two hours!) and easy read. Unlike Master of Sound, this book has about ten illustrations. Another difference is that Bell is an adult in this story. The focus of this book is on Bell as an inventor. The story clearly shows the reasons Bell has come to believe the telephone will not work and has gone on to other inventions. Abigail and her three friends (all boys) must figure out a way to inspire Bell to continue working on the phone. It is the premise of each book in this series that someone is “giving up” and the time-traveling kids have to convince them not to do so. I like this inspiring theme. I assume Deutsch and Cohen are being historically accurate when they describe the materials Bell is using to try to make the phone work. These details might be interesting to a reader with a scientific bent, although they were not to me. So what do these books have in common? These are wholesome tales, with not a bit of objectionable subject matter, geared toward younger middle grade readers. Both have a few pages of interesting historical info at the end. Boy and girl characters are equally represented. Neither of these books are “must reads”; I would recommend many other time travel books more highly. However, if a student was picking a time travel tale in order to learn about a historical figure, perhaps to supplement non-fiction reading, these two books would be good choices. 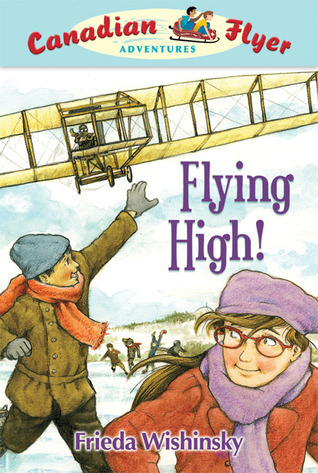 After I learned about what an extraordinary inventor Bell was, I should not have been surprised to learn of yet another middle grade time travel tale about Alexander Bell, again one of many books in a lengthy series, entitled, Flying High! (Canadian Flyer Adventures, No. 5), by Frieda Wishinsky. I haven’t had time to read this one yet. Also, after reading the two fictional works, I was so motivated to learn more about Bell that I bought and read part of Alexander Graham Bell: The Life and Times of the Man Who Invented the Telephone, by Edwin Grosvenor and Morgan Wesson, an absolutely fabulous biography of Bell, written for adults but in an easy-to-read style, with over a hundred photographs. 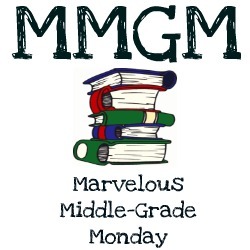 You can find links to many marvelous middle grade book reviews on Shannon Messenger’s blog. 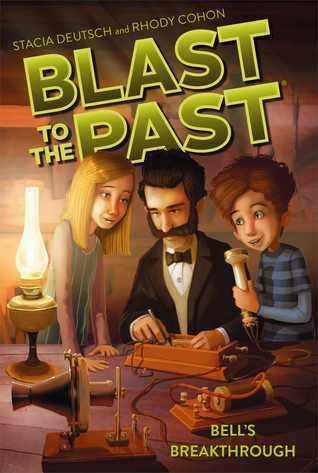 This entry was posted in Book reviews and tagged Alexander Graham Bell, Blast to the Past, kids' time travel stories, middle grade fiction, time travel books for children, Treasure Chest series. Bookmark the permalink. So interesting there’s more than one time travel tale about Alexander Graham Bell. I wouldn’t have thought there would be so many. You’ve provided a wealth of good stories on A. G. Bell. I may not have time to answer my phone this week! I’ll be tracking some of these down to read. Thanks for sharing. These sound really intriguing and right up my science-loving son’s alley. I always enjoy books too, especially time travel, when historical figures make an appearance.